The Oceanside Fire Department in California is using 3D printing to help make daily tasks easier and improve response times. Fire Captain Andy Stotts, who has a background in design and prototype development, first introduced 3D printing to the fire department after watching a YouTube channel showing a phone case being made using 3D printing – a familar story for many 3D printing enthusiasts. Stotts recognized the potential of the technology and immediately became hooked. After a friend and teacher referred Stotts to nearby Robo 3D, he purchased his own desktop 3D printer and began printing parts from files he found online. “I first used it to print useful items found on Thingiverse – things for my shop or around the house. I then started designing replacement parts and accessories for the fire department,” he said. 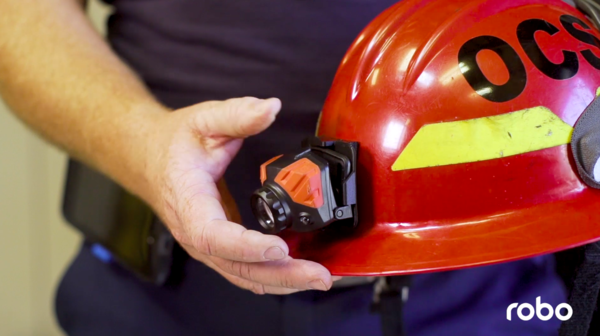 It didn’t take long for Stotts to realize that some of his everyday problems could be solved with 3D printing, as the technology is increasingly put to use for on-demand spare parts in fire stations. He first started designing and 3D printing small objects and spare parts for older equipment and also found ways to organize gear and equipment better. Being located so close to Robo 3D helped Stotts develop a relationship with the founders and learn more about the technology. He now owns 14 Robo R1+ machines, as well as the newer Robo R2. One of the most popular items Andy designed and printed is called a “No-Lock,” which prevents firetruck doors from becoming accidentally locked due to gear bumping into them. The No-Lock securely wraps around the lock and prevents anything from pushing it down. When the outcome of an emergency is determined by a matter of seconds, it didn’t take long for the value of the No-Lock to be realized. This resulted in Stotts being asked to equip every firetruck with the No-Lock. Based in San Diego, Robo was founded in 2012 by a group of students from San Diego State University. They launched their first model in 2013 and have since expanded their product line with the high-performance Robo R2 and compact Robo C2, which feature WiFi connectivity for wireless 3D printing.